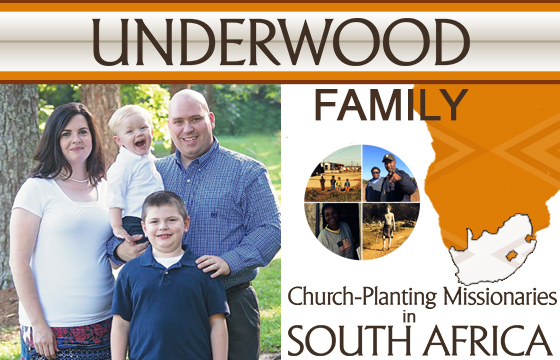 My wife, sons, and I are currently serving the Lord as church planting missionaries in South Africa. Our hearts’ desire is to reach, train, and encourage folks all over the world to accept Jesus Christ as their personal Savior, and train others to do the same. Below is my wife and my testimonies of how God lead us to where we are today! I was saved at the age of 7 during a Vacation Bible School, however, not being raised in church; I did not follow the Lord in believer’s baptism until I was 11 years old. It wasn’t until the next spring, during a transition year from pony league to little league, that I met Pastor Wayne Cofield; my new baseball coach! In order to “secure” my spot as a starter, I began attending services at Whitfield Baptist Church. It was there that God started a work in my life that has led me and my family to reach the people of South Africa and the world with the gospel of Jesus Christ. At age 16, I had the opportunity to visit Peru, South America on a ten day missions trip. There, I met Veteran Missionary Austin Gardner, now Pastor of Vision Baptist Church. The following year, I returned to Peru for six months in order to learn and train on the field, for the field. I also spent 6 years in the Army, serving 16 months in Iraq during Operation Iraqi Freedom from June 2006 to September 2007. The Lord used that time in my life to teach me the discipline I lacked and the intestinal fortitude needed to accomplish His good work! The past 5 years, I have been privileged to grow and train under Pastor Tony Howeth of Newton Baptist Church. I have seen first hand the relationship model of Paul and Timothy through Pastor Howeth’s leadership. I am very grateful for the Lord using Newton Baptist Church to be not only our sending church, but our family! Today, I am blessed and encouraged to have not only the obligation, but the opportunity to serve Jesus as a church planting missionary to the field of South Africa It is our intent and goal to replicate the biblical model through which I have been trained to the Xhosa people of South Africa! My entire family is Seventh Day Adventist, and raised me as such. I grew up believing that my salvation rested in keeping the Sabbath, abstaining from meats, and keeping the Law of God. It wasn’t until I met, and married Stephen that I truly placed my faith and trust in Christ and His finished work on the cross! We had been married for seven months and had been attending Whitfield Baptist Church. During the Mission’s Conference on a Tuesday evening, the Holy Spirit of God convicted my heart of my desperate need of salvation. The next evening, before the service started; I met Pastor Wayne Cofield along with my husband, and was shown from God’s Word that my “good works” were not sufficient to pay my sin debt. That moment, I asked Jesus to forgive me, accepted His payment on the cross, and trusted in Him alone as my personal Savior! I can honestly say that my life has never been the same! Later that same year, at the Our Generation Summit, I was able to hear testimony after testimony of God’s great work in the lives of others on foreign fields. My soul was stirred within me and my heart moved to compassion of a world that was lost without Christ. That Summit, I submitted myself fully to service to my Lord and my husband. Whenever and wherever God wanted us, I was willing to go! I am truly honored to have the opportunity to serve my Savior along side my husband and family as church planting missionaries to the country of South Africa. I rest in the fact that Christ has given His all for me, and I in return wish to give my all for Him! My heart’s desire is to follow my husband, raise my children in the nurture and admonition of the Lord, and to reach others with the gospel of the Lord Jesus Christ!